Rumors about the death of Libya’s strongman, renegade general Khalifa Haftar have been denied, still he is reportedly in coma in a Paris hospital after suffering a severe stroke during a visit to Jordan. The news of the Hafter being hospitalised sent shockwaves in Libya prompting analysts to predict an exacerbation of mayhem in the war torn country where forces loyal to Haftar have asserted control in much of the eastern territories. The 74-year-old general is backed by Egypt, the UAE, and Russia as he represents himself as a stabilizing force in Libya who could be relied on to confront Islamist factions in the country’s east. Western powers have showed openness to engaging in talks with Haftar for Libya’s stability despite his disagreements with the UN-backed government in Tripoli. 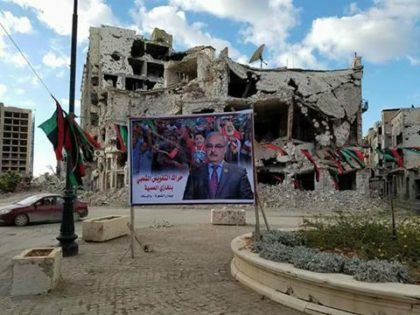 Observers say that if Gen Haftar were permanently incapacitated one of his sons might try to take up his mantle but that other elements of his coalition – especially local factions from eastern Libya – might go their own way. Haftar’s Libyan National Army, largely based in the east of Libya, has been making steady military progress, but has been criticized for using brutal methods in a country overcome by civil war almost ever since the toppling of Kadhafi in 2011. Written by: Jaber Ali on April 17, 2018. Posted by Jaber Ali on Apr 17 2018. Filed under Headlines, World News. You can follow any responses to this entry through the RSS 2.0. Both comments and pings are currently closed.